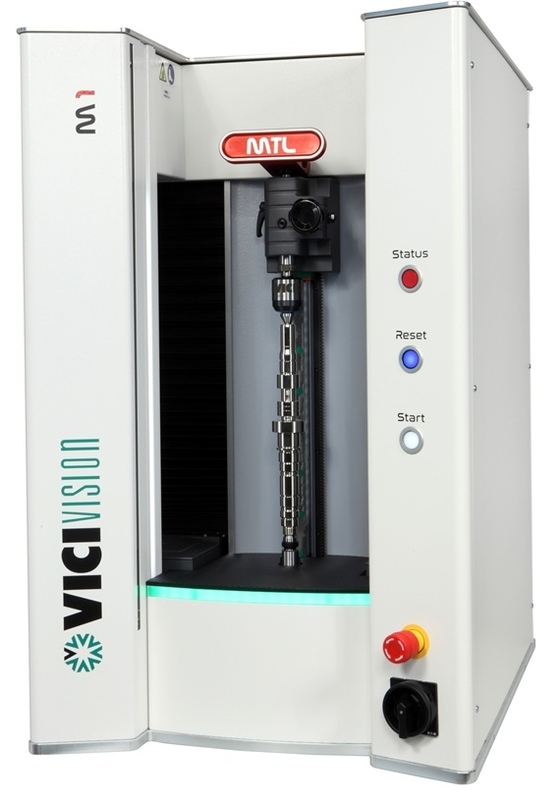 M1 offers top of the range performance in a compact optical measuring machine with maximised ergonomics. It’s the ideal system for measuring multi-spindle lathes or sliding head lathes, from simple fittings to small shaft measuring up to 30x600mm. M1 is designed to optimise your production routine, with faster measurement it reduces measuring times- setting a new bar in its sector. Its unique design gives direct access to the piece, ensuring practical loading for both small and large turned components. The LED lit loading area provides excellent visibility for every measurement task, whilst the full metal housing protects oil spillages in the working environment and new photoelectric cells improve measurement process safety. The vertical positioning of the piece facilitates ease of loading, even with pieces up to 300mm in length by using either cone tailstocks, clamping chucks or negative cone cusps for blocking pieces without centres. With the integration of ball bearings on the prismatic guides, the upper tailstock is able to slide with precision, guaranteeing accuracy. Whilst the upper tailstock is also equipped with a brand new, more practical load lever, activated by a rack and pinion providing the ultimate accuracy as the component to be measured approaches. Its counter-weight allows for the entire system to seamlessly carry out turned part measurement. It is equipped with a double temperature compensation system (on both diameters and on lengths) as well as a unique “Air Flow” cooling system allowing it not only to withstand even the toughest environments, but also making it ideal for use directly on the shop floor. Its self-programming functions and step-by-step programming features facilitate advanced operations alongside integrated software, which allows the user to work on the real image of the piece whilst also enabling manual loading of the measurement programs either by barcode (not included in the supply of the machine) or by self-recognition of the component’s image. • Operators are more independent during inspection. • Measurement is not influenced by manual intervention. • Allows to set tool offset before values are out of tolerance.